Highlights : Visit to Tipu Palace in Bangalore; Visit to Mysore Palace, one of the biggest palace of the country Wildlife viewing at Periyar National park and Tiger Reserve. The South India Temple Tours will give you an opportunity to visit some of the world wide renowned temples of South India. The best you can watch at these temples are its architectural excellence, which make each of the temples unique. These temples date thousands years back, and are associated with numerous of mythologies, which heighten the importance of these temples. Try knowing some of the mythologies, as it will definitely add fuel to your want of understanding the local rich culture. Moreover, enjoy worshiping at several of these temples in the traditional South Indian style. Along with visiting many of temples, you will also be enjoying wildlife viewing at Periyar National park and Tiger Reserve, which is said to be one of the best managed wildlife sanctuaries of India. Day 1 : Chennai. Arrive at evening. Check into hotel, and stay overnight. Day 2 : Chennai-Mahaballipuram-Kanchipuram-Chennai. Drive to Mahaballipuram and Kanchipuram in morning, and enjoy sightseeing of the world famous magnificent temple complex. In evening, return back to Chennai. Day 3 : Chennai-Bangalore. Start sightseeing tour of Chennai, and visit its famous tourist attractions including St Marys Church, Fort St George, Kapaleeswarar Temple and Marina Beach. In evening, catch flight for Bangalore. Check into hotel, and stay there overnight. Day 4 : Bangalore-Hassan. Visit Bull Temple, Tipus Palace and Lal Bagh. After lunch in noon, drive to Hassan (180 km). Arrive at hotel (at Hassan) by dinner time, and stay overnight. Day 5 : Hassan. Take morning visit to two of famous temples of Belur and Halebid. Later, drive to Mysore (150 km), and check into hotel, where you will stay overnight. Day 6 : Mysore. Full day sightseeing of this historical city of south India will engage you visiting its world famous Mysore Palace, the biggest palace in the country. In evening, you will drive to visit Vrindavan Garden. Return to the hotel by dinner time, and stay overnight at hotel. Day 7 : Mysore-Bangalore-Cochin. Leave Mysore early in morning, and drive to Bangalore. Afternoon at Bangalore, catch flight for Cochin. Check into hotel after reaching Cochin. Day 8 : Cochin. Cochin, the historical city of Kerala, busy you for the whole day, as you visit all its important sightseeing locations. Visit its forts, palaces and several, of churches, and sea beaches. In evening, watch Kathakali dance performance. Overnight at hotel. Day 10 : Thekaddi-Madurai. Early in morning, take boat ride in Periyar lake. Later, enjoy game viewing by taking up Elephant Safari/Jeep Safari. See hundreds of species of floral and faunal inhabitants in the park. Afternoon, drive to Madurai (140 km), where you reach in evening. Overnight at hotel. Day 11 : Madurai. Madurai is the home to world famous Meenakshi temple. For full day, today, you will be discovering its grand structural beauty. Afternoon at leisure. Watch cultural performance in evening. Day 12 : Madurai-Trichy. After taking breakfast at hotel, you will drive to Trichy (140 km). Afternoon, visit Rock Fort Temple and Srirangam Island. Overnight at hotel. Day 13 : Trichy-Tanjore. 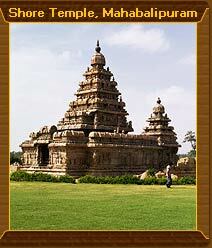 Drive to Tanjore (54 km) in morning, and visit its famous and beautiful Chola Temple dedicated to lord Shiva. Return to Trichy afternoon, and spend evening in leisure. Overnight at hotel. Day 14 : Trichy-Chennai. After breakfast in morning, catch flight for Chennai. After reaching Chennai, change flight, and catch your flight taking you to you home. This tour covers the southern region of India which is considered the treasure trove for temples and when you choose this particualar tour, you advent out to explore the dravadian temples, some of them are as old as the civilization itself. Though being a temple tour, Culture Heritage India team have tried to inculcate various other architectural monuments of par excellence.